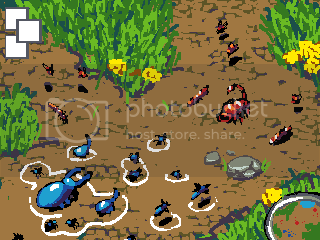 Challenge winner Xion Night wants you to create a mockup of a game, in any genre, that pits insect forces against one another. For the purpose of this challenge anything that would fall under the category of "arthropod" is OK. Exactly 320 (width) x 240 (height). Mockups are always a good idea. Sorry, but this bonus link is absolutely abnormal. i'm confused what is refered to as a bug. are insects allowed? what "bugs" are covered in this word? are we allowed to make up our own? do we have to include a menu in this mockup or not? the peice can it be a menu if it shows the bugs fighting or must it be in game play? also is there a certain view we must keep to or not? there are so many questions that aren't answered in this challenge post. i like the sudden change in challenge for the week. but it would have been nice to have been given more info. i ask this because bugs and insects are suppose to be different things but most consider them the same, and things like scorpions and spiders are aracnids so they aren't considered to be either. so it doesn't leave hardly any options to choose from. and with so little options i can't find a single one which would be beleivable to actually go in a full on fight with something. so what am i suppose to do, draw a grass hopper covered in bed bugs? I'm almost 100 % sure that in this case "bugs" refer to most arthropods. e.g. insects, arachnids and even centipedes if you wanna go crazy. This challenge obviously isn't about correct classification but about creepy crawler combat! thanks, i was hoping it was creepy crawlies. it is definitily easier to understand then saying bug and then saying insect. that confused me alot. if i get a good idea for this i'll definitely enter. My idea and wip. Now I need to find the time to finish it! Bugs for a game... gotta start working on it, lolz. This might sound like a dumb question but, are we limited to just one scene, or can we create a batch of screens for the submission? Probably, it is a mockup of a game, so that would allow/include other "screens" of the game. @rustedge - The challenge calls for just creating one mock-up image, and therefore should show just one screen. I suppose it would be ok to show multiple screens if it were showing a splitscreen multiplayer or something similar though. So generally, no, this is not a challenge where you are going to be showing many different screens; it should just be one 240x176/320x240 scene from the game. And then they eat them. I usually work on something right after they say what the challenge is about, but this time I'll wait till the very end. never really made a mockup before... anyway! very rough, very quick, very done-in-2-min-during-lunchbreak sketch of dung beetle dung-attacking its yet to be decided opponent... was thinking mantis for colour contrast? Maybe a cricket or grasshopper. 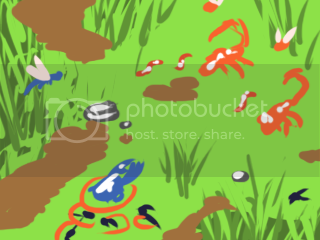 Also, to make it more like a mockup, I think you should remove the text, and maybe add some sort of life bars on the top of the pic, like a fighting game. oh hell yes, that's just the concept - there will be life bars, possibly a circular "portrait" of each, and the text's gonna go. was thinking maybe I should make the chars smaller though - so they've space to move back and forth to fight - should assess that before starting to work on it. Its not even a WIP anymore, and I've already submitted it, but oh well. it all looks great but your characters blend in so much ith the background its hard to tell were they were until i looked really hard.